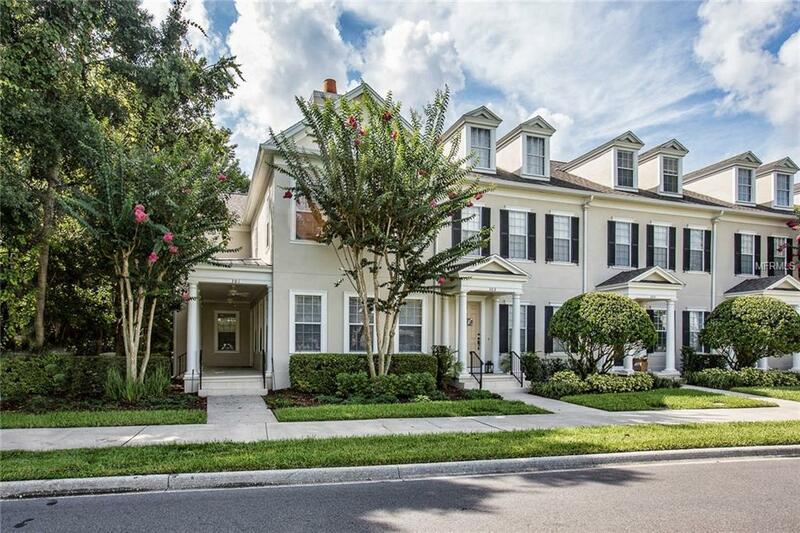 This Lovely ISSA-built Townhouse is located in the charming North Village neighborhood of Celebration. This Corner End unit is located on a quiet Cul-de-sac adjacent to a wooded conservation area to provide ample privacy. Enter the home below the covered entry porch into the downstairs area. The downstairs area offers high ceilings and warm wood floors, a Large open kitchen overlooks the Family room. The Formal Dining and Formal Living room are conjoined by a wood-burning fireplace to create the perfect ambiance. Upstairs the Master Bedroom offers ample space as well as 2 walk-in closets, large Master Bathroom with 2 vanities, whirlpool tub and Large shower. Two additional bedrooms are large enough for King size beds and share a Jack and Jill bathroom. For convenience an Upstairs Laundry room, complete with stackable Washer and Dryer, complete the upstairs. The home offers a two-car garage, with extra storage space. The Home includes a studio garage apartment complete with kitchenette and is perfect for rental income or guests. This Townhouse has it all! Come see Everything it has to offer!